Dark matter halos are theoretical bodies inside which galaxies are suspended; the halo's mass dominates the total mass. These halos cannot be observed directly, but astronomers infer their presence by the phenomenon of gravity lensing—the distortion of background objects by strong gravitational sources that act as lenses. Astronomers can even study distant galaxies magnified by the gravitational lensing of closer gravitational objects. Researchers have known for decades that the clustering of galaxies does not mirror the clustering of most of the matter in the universe. The concept that galaxy distribution correlates to matter density at a given site in the universe dates back to 1984. In a galaxy cluster, matter distribution is highly clustered, and halos form at the peak of this distribution. This is called the halo bias. Halo bias can also be framed as the relationship between the spatial distribution of galaxies and the underlying dark matter density field. Clustering is enhanced relative to the general distribution of mass in the cluster. But there are other theorized properties besides mass that can affect clustering; physicists refer to these as secondary bias, but efforts at identifying them have been inconclusive. 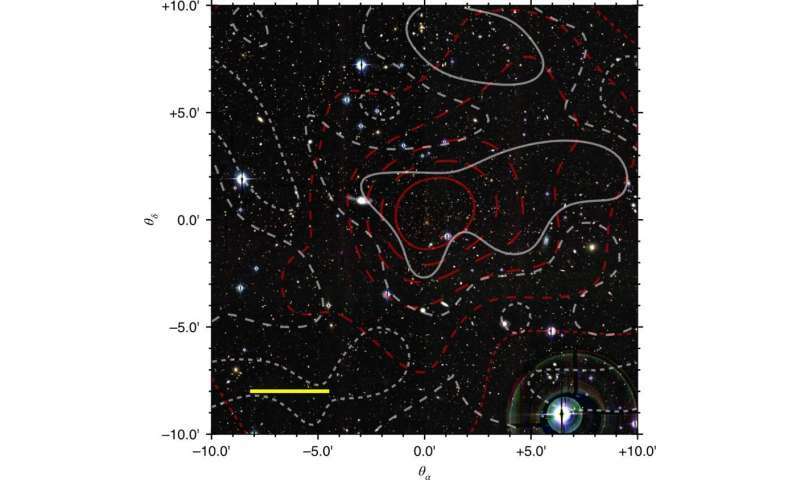 Recently, a group of Italian researchers published a report in Nature Astronomy on a study of PSZ2 GO99.86+58.45, an extremely dense galaxy cluster with a very large gravitational lensing signal. They report that the system is extremely rare within the framework of galactic structure formation, and its characteristics strongly imply the effectiveness of enhancing mechanisms other than mass on dark matter halos. The researchers analyzed data from two publicly available shear catalogs—the CFHTLenS and RCSLens. They found that the outskirts of the cluster have a very large gravitational lensing signal traceable up to 30 megaparsecs. Its high signal-to-noise ratio implies environment matter density that far exceeds the cosmological mean density. They report that the extreme density of this cluster cannot be attributed solely to mass. Additionally, the researchers report that their findings agree well with the Lambda cold dark matter model (ΛCDM), which holds that the universe contains a cosmological constant denoted Λ associated with dark energy and cold dark matter. Cold dark matter is a hypothetical form of dark matter in which dark matter particles move slower than light. The ΛCDM model proposes that structure in the universe forms hierarchically from the bottom up, as smaller structures collapse under the influence of their own gravity, and continually merge into larger structures. It is currently the favored model for structure formation in the universe. The researchers conclude by noting the utility of lensing analysis in the study of galaxy clusters. They write, "Next-generation galaxy surveys will routinely perform the lensing analysis of single halos out to very large radii, as we have presented here." Galaxy clusters form at the highest-density nodes of the cosmic web. The clustering of dark matter halos hosting these galaxy clusters is enhanced relative to the general mass distribution, with the matter density beyond the virial region being strongly correlated to the halo mass (halo bias). Halo properties other than mass can further enhance the halo clustering (secondary bias). Observational campaigns have ascertained the halo bias, but efforts to detect this secondary bias for massive halos have been inconclusive. Here, we report the analysis of the environment bias in a sample of massive clusters, selected through the Sunyaev–Zel'dovich effect by the Planck mission, focusing on the detection of the environment dark matter correlated to a single cluster, PSZ2 G099.86+58.45. The gravitational lensing signal of the outskirts is very large and can be traced up to 30 megaparsecs with a high signal-to-noise ratio (about 3.4), implying environment matter density in notable excess of the cosmological mean. Our finding reveals this system to be extremely rare in the current paradigm of structure formation and, implies that enhancing mechanisms around high-mass halos can be very effective. Future lensing surveys will probe the surroundings of single haloes, enabling the study of their formation and evolution of structure. Wow, what happened? No nutjobs pretending there's no gravitational lensing? This down to earth approach would find all matter is suddenly visible and a correct calculation of galactic gravitational lensing obtained – no magic required! "Researchers study gravitational lensing around an extremely dense galaxy cluster"
.....and what else would you expect in an area of such concentrated observable matter? Maybe nutjobs coming here claiming there can never be gravitational lensing except in the presence of Dark Matter? From another article: "About eighty-five percent of the matter in the universe is in the form of dark matter, whose nature remains a mystery. The rest of the matter in the universe is of the kind found in atoms." Well, I do love a good mystery.,,this Dark Matter and Dark Energy. But something that cannot be seen, felt, heard, tasted, or smelt would be, fairly well, as granville mentions - a bit of witchcraft - a magical potion of indescribable flavoring made with ingredients of unknown proportion - a wizardly concoction that remains hidden within the hallowed cupboards of the masters of time and space - It is there for no one to see, for it is the unknown and the unknowable. Personally, I would go with the CMBR as that 85% since it is everywhere and has been since the beginning. Science should dispense with the Voodoo and rattling of bones to explain why Matter is not taking up all of Space. A master piece of wizardry of matter in the dark art of witch craft! These magic spells of eloquence are an all invading potion of witch craft far greater than that found in the quantum fluctuations where the dark art of matter hides its secret! The various dark matter theories (and there is more than one) make testable predictions that the various alternative theories to dark matter theory do not (and vice versa) thus to suggest dark matter theory is unscientific and like religion just because dark matter has (so far) not been directly observed is just nonsense. Dark matter theory is a scientific theory and no less or more so than the current alternatives and for the same reasons. All the current credible theories make some yet-to-prove assumptions. Dark matter theory is a scientific theory and no less or more so than the current alternatives and for the same reasons. Wrong humy, it is a Pop-Cosmology Theory, not a scientific one, learn the difference or be forever lost in a world of fantasy. Those of you in the Pop-Cosmology crowd think it's cool to indulge us with what is tantamount to a Universe in which ENTROPY the 2nd Law of Thermodynamics does not exist beyond our solar system. To get all this exotic stuff Pop-Cosmology is constantly conjuring up requires the violation of every known immutable Law of Physics, but hey you think, that's the price of progressive thought. In the meantime Pop-Cosmology keeps invoking the name of Albert Einstein for things he never wrote or otherwise stated, like the fantasy of invoking General Relativity as a basis for the existence of Black Holes against which Einstein was adamantly opposed & wrote a subsequent paper in 1939 clearly stating such a position. The magic of theories are in the quantum fluctuations of the windmills of the mind! Witch craft is the magic of theory of matter that is dark is still hidden in the quantum fluctuations Humy. You got it! The Pop-Cosmology Nutters are at it! Why are you so terrified of forums? Because you are a Pop-Cosmology Nutter with an Einstein complex, so funny. What are you? A glutton for punishment? In how many different places do you need to read the same thing? What is "an Einstein complex"? Punishment? What punishment? I enjoy poking holes in Nutter's reasoning. What happened on the other thread where you tried to comment on the evolution of the human hand? I would love to hear your crazy thoughts on evolution. Your Einstein complex is your deluded idea that you understand relativity as Einstein did of course. When from your comments it appears you know absolutely nothing. What else? Ya gotta link that one... I need a laugh! So, he's an engineer turned nuclear engineer turned biologist among his other engineering superior knowledge and "scientific research"? thanks for this: set up my profile just to watch should benji show up to post! Your Einstein complex is your deluded idea that you understand relativity as Einstein did of course. .................why do you think otherwise? I eat a couple apples everyday, probably has something to do with Einstein, I've heard it was his favorite fruit. Perhaps only a coincidence, but I also enjoy eating apples (Red Delicious and Gala apples). However, every time that I bite into an apple (or any other good morsel of food), I have noticed that what I am enjoying is -- MATTER - which is said to be ~15% of the normal content of the Universe. Whereas, the other 85% is "claimed" to be indisputable scientific evidence of a strange substance of unknown content (Dark Matter) that permeates the Universe wherever Matter is not present. Therefore, before I bite into that apple, is that Dark Matter that is entering my lungs as I breathe in before taking a bite of the apple? As I walk through my house and go outdoors to my vehicle, am I walking through Dark Matter? Does my body, which is made of Matter displace Dark Matter so that the DM is shoved aside as my body becomes like a projectile passing through this unknowable DM substance similar to a planetary body orbiting the Sun? At 85% (not an insignificant number) the unseen stuff must be EVERYWHERE...except where atomic/molecular structures reside. Does Dark Matter constitute a molecular structure? If not, then it is very likely that the 'gravitational lensing signal' is simply a reflection of the photons emanating from material bodies in a star cluster. IF the DM is composed of molecules, then it should be seeable, depending on the type of molecule. A matter that is dark - A riddle in the shifting sands to ponder on the handfuls of matter that is dark! Darkmatter in a nut shell, physics world consequentially shuffled the commentaries to where matter that is dark to the quantum fluctuations and there they lie for eternity! From your link: "Archaeological evidence suggests that early hominins participated in a variety of tool-related activities, such as nut-cracking, cutting flesh, smashing bone to access marrow, as well as making stone tools. However, it is unlikely that all these behaviours equally influenced modern human hand anatomy." That should read "Paleoarchaeological evidence" which would be more in line with the study of Early Hominins. "To understand the impact these different actions may have had on the evolution of human hands, researchers measured the force experienced by the hand of 39 individuals during different stone tool behaviours—nut-cracking, marrow acquisition (...) - to see which digits were most important for manipulating the tool." That is 39 modern-day individuals with already evolved hands, certainly not the hands of early hominins. Flawed study. ALL IS WOO and wizardry until proven without a doubt by sufficient unadulterated evidence. Quantum fluctuations? Seriously? Does that account for the unseeable properties of DM? When Einstein calculated Photon Deflection in General Relativity to within 0.02% of error, he did it based on the visible mass of the Sun & the consequential force of gravity based on the quantity of it's visible mass. Einstein thus proved there was no hidden unseen matter in 1916 within our solar system. Then about 1932 zany Zwicky claims he found DM, but in essence that it only exists in certain places & most specifically not within our solar system because we just sort of didn't need it. Hmmmm? Surveillance_Egg_Unit:- phys.org is even-handed as many articles of matter it counterbalances it with articles that are dark as does physics world, the darkmatter acolytes do not seem to like dark matter questioned even when in favour as though all questions on matter that is dark are really questioning darkmatter. In reality all questions are actually questing darkmatters reality! As handfuls of the stuff in the fluctuations proves the point! ...........so if you're following me here, you are seeing that I agree with you in YOUR analyses, but your analyses is deeply flawed from the point of view of Pop-Cosmology aficionados. If our solar system is the ONLY place in the Universe DM is not found, what does that have to say about our solar system? It's UNIQUE? Uh, oh......gotta be careful about where we go from here, right granDy & SEU? Benni> If our solar system is the ONLY place in the Universe DM is not found, what does that have to say about our solar system? It's UNIQUE? Uh, oh......gotta be careful about where we go from here, right granDy & SEU? Matter and matter that is dark does not discriminate! What you have unearthed in the text Benni is Obfuscation, a disease that appears to be virulent of late Benni, we hope you're well inoculated; we don't want you to go down with a bad case of the Obfuscations. My momma is gonna be disappointed with this answer, so for her sake, can you try a different explanation? "a quantum fluctuation is the temporary change in the amount of energy in a point in space, as explained in Werner Heisenberg's uncertainty principle." So, let's conjecture this for a moment. Energy is derived from the transformation of mass to energy. The question being, transformation of DM? My analysis is strictly biased wrt the human element and experiences. I cannot speak for any possible Life Forms outside of our Solar System, only wrt that which is detected by the 5 senses and mind/consciousness. Zwicky seems to have come upon an idea that this DM substance can rationalise and decide for itself which part of the Universe it wants to occupy. Hey my friend, just askin', no more than that. If the reader thinks it is "Obfuscations" then they will need to be the ones to explain why our solar system is the only place in the Universe no dark matter will ever be found. Zwicky seems to have come upon an idea that this DM substance can rationalise and decide for itself which part of the Universe it wants to occupy. ......kind of an all pervading spirit huh? For Zwicky's Dark Matter to choose where it would prefer to be or not to be as to location, it would require either a Mind or it would be purely instinctive. And if either were the case, the next alternative would be that it is a Life Form. Unless, of course, the DM substance is unable to enter into the confines of our Solar System - for whatever reason, that was unbeknownst to Zwicky himself. Zwicky sounds as though he was a conjurer, a charlatan, a scam artist. I still stand by my hypothesis that the 85% of the Universe's content is the Cosmic Microwave Background Radiation. Benni> a quantum fluctuation is the temporary change in the amount of energy in a point in space, as explained in Werner Heisenberg's uncertainty principle The question being, transformation of DM? So how did our galaxy manage to get out in front of all the "decoupling photons" so that we can look back on them as they are only just now CATCHING UP to us? Decoupling isn't yet complete is what I guess the concept is, I guess the CMBR has something rated in HALF-LIFE? This Dark Matter that will not or cannot enter the Solar System, IF it really exists, its general makeup may be incompatible with the Matter within our Solar System, and/or subject to annihilation in at least some parts of the Universe. There may be some pockets of specialised planetary Electromagnetism and/or gravity fields, etc. which might destroy the DM upon connecting with such energies. As I haven't seen any real evidence wrt the existence of DM, I will withhold all approval and enthusiasm until such evidence unfolds and its story is widely disseminated. The CMBR self-propagates as the Universe expands so that it continues to fill the spaces where Matter is not present. .......so what then causes all this radio-wavelength activity so that it NEVER just comes to a halt? On planet Earth when we humans create this same exact photon energy, it stops when the transmission tower(s) break down, like what happened to the cell phone tower nearest us over the weekend that finally got my wife off her damn cell phone for the rest of the day until yesterday. Take a woman's decoupling photons away from her & you get the feeling the world is about to end. and/or subject to annihilation in at least some parts of the Universe. There may be some pockets of specialised planetary Electromagnetism and/or gravity fields, etc. which might destroy the DM upon connecting with such energies. "Energy/Mass cannot be created or destroyed, it can only be changed from one form to another." ....my good buddy Albert to the rescue. Ojo might be right, I just might have an "Einstein complex". Yes, that should be true of ORDINARY Matter/Energy. But Dark Matter is still an unknown. It still is uncertain exactly what its components are and its properties, if any, are still not understood. All that is "known" about DM is that it is detected through "gravitational lens signals" - otherwise it is unseeable through ordinary means. Is DM a form of Mass or Energy or both or neither? What is its purpose exactly? Does it self-propagate like the CMBR as space expands, or does it remain static? We don't know. There are many radio sources, but you may be referring to localised radio transmissions and satellites beaming signals down to the planet and to each other. BTW - re: your better half - that is way TMI that may be used against you. What you say in PO is forever. I guess! Musta spoke too soon. Recombination Epoch at 378,000 years after BB - Sounds like a Biblical Quote from the Scriptures! Has this got anything to do with galaxies at 13.8billion years old, give or take the odd couple of 100 thousand years? Da Schneib> Wow, what happened? No nutjobs pretending there's no gravitational lensing? As usual in the vacuum Da Schneib, the truth is true as equally as its not. I can't see any indication of emerging commentary photons not producing magnified, distorted, multiple images revealed on the photographic plates as this is a physical reality that cannot be disguised by diligent astronomers. Benni> "Energy/Mass cannot be created or destroyed, it can only be changed from one form to another." Albert Einstein ....my good buddy Albert to the rescue. Ojo might be right, I just might have an "Einstein complex". Which comes to our mass in momentum unless acted on by a force – theorecticly a force requires no energy to stop mass in momentum Benni ! ......you're changing velocity by stopping a mass in momentum, that's a change in energy. Work is change in energy (KE). Depending on how the work is applied, it will increase (or decrease) a specific quantity of energy. If the work leads to a change in the (absolute) velocity, it will modify the kinetic energy. Theoretically to produce a force requires zero, energy reducing the accelerative force to 1.0x10-15 seconds homes in on the theoretically zero energy force! This could very well apply also to the firing of a handgun or rifle. I agree that the velocity/momentum of a bullet/projectile in flight may be changed by certain factors, but which requires the stopping energy of a mass. But what has this to do with the supposed Dark Matter and the gravitational lensing as a mirrored reflection of stellar/planetary bodies behind and farther away? Similar to that little device that enables one to see around corners. To me, nothing. grandy brought it up so I just dropped the comment so as to let him know that I understand Kinetic Energy versus Electro-Magnetic Energy. There are some who frequent this chatroom who imagine that if you think of an electro-magnetic wave as being a photon, then they start imaging a PARTICLE in their minds, then imagine a photon can thus be treated as a tiny piece of virtual mass subject to 1/2mv² for the purpose creating a photon sphere of a BH. Jonesy, being one who has been here numerous times talking about ESCAPE VELOCITY of a photon, Schneibo as well, others. They simply don't know enough Special Relativity to comprehend that ESCAPE VELOCITY is derived from kinetic energy equations & therefore cannot be applied to a PHOTON, but they keep trying this kind of silliness anyway. Escape velocity of a PHOTON?? ROFLOL Did you tell them that c works just fine? Have recently (in the last few minutes) been pondering whether or not there is a possibility that this Dark Matter which is now so popular is, in reality, a form of antimatter. IF such a thing could be possible, then all Matter in the Universe is in deep trouble. I am hypothesising that if DM is actually antimatter, if it connects with regular, normal Matter such as planets, stars, etc. the merger could cause a huge explosion/annihilation. Pockets of antimatter in the form of so-called "Dark Matter" might be floating around the cosmos, maybe attracted to antiprotons, etc. But if it comes in contact with a cluster of stars/planets it might spell doom for that cluster. Lightning/thunderstorms over the Earth produces antimatter. -"In theory, a particle and its anti-particle (e.g., proton and antiproton) have the same mass as one another, but opposite electric charge and other differences in quantum numbers. For example, a proton has positive charge while an antiproton has negative charge. A collision between any particle and its anti-particle partner is known to lead to their mutual annihilation, giving rise to various proportions of intense photons (gamma rays), neutrinos, and sometimes less-massive particle–antiparticle pairs. Well, I truly hope that DM is just a flaky theory and not something more sinister. Stan Laurel pointed out while carrying a piano up miles of steps no work was being done! And I thought I would bring to everyone's attention what Laurel and hardy on carrying a piano up miles of steps, Stan Laurel pointed out while the sweat and curses of Oliver Hardy on holding the heavy end of the piano, no work was being done! Benni on closer examination in the mathematics to produce a force as you know Benni, the force is decelerating the mass in momentum such that there are dynamics at work, mainly the distance L 1x10+15 Newton's moves through in 1.0x10-15 seconds decelerating a mass of 1.0x10+15kg moving at 1m/s in 1x10-1.0x10-15s what is the energy the force expends in bringing the femto-mass in femto-second steps to a halt? In the femto world of the atom all forces come in femto-metre and femto-second steps as this is how the atoms apply their forces of attraction and repulsion, atoms are not made of energy as it does grow on trees, they have a limited supply and they have to eke it out wisely. You hit the nail on the head with this. The Pop-Cosmology crowd in this chatroom really does believe there is a gravity field that can exert such force on an electro-magnetic wave that it can reduce it's velocity to zero, and that's how they come up with their theories about black holes. They don't know gravity has zero effect on "c", they don't know it because they don't comprehend the difference between kinetic energy & electro-magnetic energy. Sometimes the Pop-Cosmology aficionados imagine they can employ gravitational lensing effects to assert that there are gravity fields so intense that those gravity fields can capture an electro-magnetic wave & eternally bend it into an orbit around a mass from which it can never escape, they point to the supposed effects of DM causing gravitational lensing as evidence for such a preposterous theory. That one charge Surveillance_Egg_Unit, is the electric field of the quarks. Which use a combination of opposite electric fields producing positive or negative, where the three of opposite electric fieds in the quarks do not annihilate in the proton, so why would six quarks in contact annihilate? Is this energy in motion? You're giving this impression Benni, as you're included in every ones absence in the matter, but don't let anything I say persuade you. As any ideas you take notice of will exclude you from Five Star Club and we don't want that to happen do we Benni! If only you understood GR it would all become clear to you. You have things so mixed up it's funny. Compton scattering is what it is. An electro-magnetic wave imparts energy to outer orbital electrons causing them to move into higher orbits within the electron shell structure of an atom. Turn off the stream of photons & those excited electrons will drop back into their previous orbital configuration within the electron shell if there was no ionization. Pop-Cosmology is as mystifying as the stars! Benni> The Pop-Cosmology crowd in this chatroom really does believe there is a gravity field that can exert such force on an electro-magnetic wave that it can reduce it's velocity to zero, and that's how they come up with their theories about black holes. They don't know gravity has zero effect on "c", they don't know it because they don't comprehend the difference between kinetic energy & electro-magnetic energy. Ojorf> If only you understood GR it would all become clear to you. You have things so mixed up it's funny. You need to educate the mystified in Pop-Cosmology Ojorf; I'm fond of dandelion and burdock where Cosmology is in my stars as a Sagittarius, but Pop-Cosmology is as mystifying as the stars! As to what Benni is implying, he's been replying to my comments so tread carefully Ojorf! As the stream of photons are reflecting each photon imparts energy moving electrons which emit photons in the process, as there is a force on the mirror implies reaction where the only reaction possible, as waves are massless as energy is massless, is the electrons mass in motion to its higher orbit which cannot produce a force because it stays within the same atom. Erm...no? No one ever in the history of science claimed that the velocity of light is changed inside a black hole. antialias_physorg> Gravity is not a force - it is a warping of spacetime. Gravity, warping of space time? - you spoke to soon Da Schneib! is the electrons mass in motion to its higher orbit which cannot produce a force because it stays within the same atom. .....when the electron changes orbit or position within the electron shell, WORK/KINETIC ENERGY is performed irregardless of whether the electron "stays within the same atom". The epitome of Pop-Cosmology denying the immutable Inverse Square Law. Gravity grows steadily weaker the closer you get to the center of a stellar mass. At the exact CENTER of a MASS gravity is ZERO. So how can there be "warping back towards the center" of a mass while gravity grows steadily weaker in accordance with the Inverse Square Law? Get a grip, geodesics as you try to describe it have nothing to do with the immutability of the Inverse Square Law. It would be interesting to see a warped vacuum, but "time" I can somewhat understand, like if i throw a clock through the vacuum & it hits something causing it's frame & time hands to become all bent out of shape. Now that's a first, the vacuous vacuum is not even recommended for a pop cosmology rating! Like I said, if you understood the just the basics of GR, it would all become clear. You have things so mixed up I totally understand why nothing seems to make sense to you. Come start a thread on the forum, let people help you. No, its for bad reason. Its because you don't have the slightest idea what you are talking about. Or is this half a vacuous hole, but where did they put the vacuous vacuum they dug out – they dug another vacuous hole in the vacuum and buried it! Benni > Gravity grows steadily weaker the closer you get to the centre of a stellar mass. At the exact CENTER of a MASS gravity is ZERO. So how can there be "warping back towards the centre" of a mass while gravity grows steadily weaker in accordance with the Inverse Square Law? Ojorf> Like I said, if you understood the just the basics of GR, it would all become clear. You have things so mixed up I totally understand why nothing seems to make sense to you. Come start a thread on the forum, let people help you. Well Ojorf back to the future genius, in words of almost what is the warping of space time, as space is the vacuous vacuum; what does a piece of warped vacuous vacuum look like? So you are also ignorant of GR. Just read up the basics on Wikipedia, it's easy enough. The answer is more vacuous than the vacuous vacuum! Granville> 583762Well Ojorf back to the future genius, in words of almost what is the warping of space time, as space is the vacuous vacuum; what does a piece of warped vacuous vacuum look like? Ojorf> So you are also ignorant of GR. Just read up the basics on Wikipedia, it's easy enough. Thank you Ojorf for you're in depth answer on what does a piece of warped vacuous vacuum look like! If you can find the Wikipedia link, don't hesitate to post for everyone to view, as even your good self obviously doesn't know! Maybe Ojorf can give us a description of the appearance of a "warped piece of an empty space". Maybe he's even got pics? How about that Ojo, you got a pic of what a warped empty space looks like? While you're at it Ojo, maybe you can put up a pic of a stellar mass in which the Inverse Square Law functions in such a way that the greatest attraction of it's gravity field is at the CENTER of a mass & not it's surface, yeah, that's in GR? OK, quote it for us if you imagine you're so literate in the thesis. Sir Isaac Newton colleagues saw fit to describe Newton's work Laws of motion and gravity. .......Dark Matter? Dark Energy? Both? Or maybe just Pop-Cosmology off on another of it's unending rants hoping to prevail against the immutable Laws of Physics such as the Inverse Square Law that Ojorf has been unable to figure out. Right Ojo? How do we reconcile the two? This question is going to haunt these dusty corridors! Maybe he's even got pics? How about that Ojo, you got a pic of what a warped empty space looks like? It can be observed as 'gravitational lensing'. I'd mention something about where Mercury was in relation to the Sun in 1919; but why bother? As has already been said, make a forum post. Let people help you. It can be observed as 'gravitational lensing'. No, that's simply concentrated energy, we do the same thing on a place called planet Earth, plasma beams, lasers, flashlights. Didn't know this did you? And guess what else, we can bend this stuff. Any well-qualified self-respected physicist would say you are talking complete and utter GIBBERISH. 'gravitational lensing' doesn't exist because it is 'simply concentrated energy'? GIBBERISH. Us bending with light with lenses is clearly us using a completely different effect from gravity bending of light in nature. Learn some real science before commenting on it. I'm happy with the notion of warped spacetime. I was pointing out to Bunni that even within a Newtonian framework, stating that '"gravity is zero [at the center of a spherically symmetrical mass distribution]" is not necessarily correct, because we can talk about the gravitational potential energy instead of force. I'm not surprised the point was lost on the both of you. It's the theory as taught by Einstein...and as demonstrated with innumerable experiments since well over a century. ;;;;;this quip you are using is not the proper application of GPE, once again, follow your own advice & stop trying to apply Pop-Cosmology fantasies to real science, you know, like the IMMUTABLE Inverse Square Law that obliterates any possibility for the existence of black holes with infinite gravity & density at it's center. You really do need to learn that gravity is MASS dependent, not FANTASY dependent. Must be all that haunting taking effect!